This tutorial explains the basics of mini quad motor: the construction, design features and other factors that can affect the performance and efficiency of a motor. This will help you choose the optimal and effective motor for your next quadcopter and racing drone build. Looking For Quadcopter Motors, Where to Start? For quadcopters of all sizes, you should know what the frame size and weight of your copter are before choosing motors. However if you are just building a 5″ racing drone, you can jump straight to the “Motor Size” section. If you are new to mini quad and FPV, please carry on reading. There are Brushless and Brushed motors in RC. Generally we use Brushless motors on larger models, and Brushed on smaller ones. I will post another article explaining the differences in more detail in the future. What Is the Frame Size and Weight? The total weight of the quadcopter should include all the components you plan to take on-board: frame, FC, PDB, RX, VTX, antenna, motors, propellers, ESC’s, LiPo battery, additional payload such as the GoPro, and so on. You probably won’t get it exact to the gram, and it’s better to overestimate the weight and have extra power than underestimate, and not be able to fly. Adding 10-20 grams to compensate for wires, buzzer, zip ties etc is also a good practice. By knowing the frame size, you can determine the maximum propeller size allowed on your quadcopter. And once you have worked out the total weight of the craft, you can estimate what kind of thrust is required for the motor and propeller combination in order to lift the aircraft. Further Reading: how to choose propellers for mini quad. A general rule is that you should be able to provide at least twice as much thrust as the total weight of the quadcopter. Remember this is the bare minimum to ensure you have a stable copter that is easy to control during hovering. If the thrust provided by the motors is too little, the copter will not respond well to your control, it might even have difficulty taking off. For faster flying such as drone racing, you should expect the power to weight ratio to go much higher than this. It’s not uncommon to see someone build a mini quad that can achieve 10:1, or even 13:1 thrust to weight ratio. Generally speaking, for acro flying, I recommend to have at least 5:1. With a higher thrust to weight ratio, a quadcopter will have better agility and acceleration. When thrust to weight ratio is too high, however, the quad can become very hard to control. Just a little touch of throttle will be enough to “shoot the quad into orbit like a rocket”. :D Of course this depends on the pilot skills too. Even if you only just plan to fly a slow aerial photography platform, you should aim at somewhere between 3:1 and 4:1. This not only gives you better control, but also provides room for extra payload in the future. For example, heavier cameras or larger batteries for extended flight time. But if you are into racing, then there is no limit :D Go as high as you feel comfortable with! The Size of brushless motors in RC is normally indicated by a 4-digit number – AABB. “AA” is the stator width (or stator diameter) while “BB” is the stator height, both are measured in mm (millimeter). What is brushless motor stator? – A stator is the stationary part of the motor, this has ‘poles’, which are wrapped around by copper wires (windings). The ‘poles’ are made of many layers of thin metal plate that is laminated together with a very thin insulation layer in between. Increasing the either the width or height of a motor will increase both the size of the permanent magnet and the electromagnetic stator coils. The main difference is, when increasing the stator height, it increases the permanent magnet size more than the coil size, and when increasing the stator width, it increases the electromagnetic coil size more than the permanent magnet. The size of propellers a motor is designed for determines the prop shaft size. Motors for 3″, 4″, 5″ and 6″ propellers all have M5 (5mm diameter) motor shaft. Modern motors have the prop shaft integrated into the motor bell, while older generation motors might have separate prop adapters. Currently, common stator sizes for 5″ propellers are 2204, 2205, 2206, 2207, 2305, 2306, 2307, 2407. Taller stator has a larger “area surface”, therefore it can cut through more magnetic field. The larger surface area also helps heat dissipation. Taller motors are known to be powerful and hold up at high RPM. Wider stator motors have a larger volume of iron and copper in the stator, and are known to make a more torquey, and efficient motor. It’s an important parameter of brushless motors, which indicates the theoretical increase of RPM (rotation per minute) when voltage goes up (without load, i.e. propeller). For example, when powering a 2300KV motor with a 3S LiPo battery (12.6V), it will spin at around 28980 RPM without props on (2300 x 12.6). Typically this is just a round up estimation specified by the manufacturer. Once you mount a propeller on the motor, the RPM decreases drastically due to air resistance. Higher KV motors would attempt to spin the propeller faster, and it can draw more current. That’s why we tend to see larger props paired with low KV motors, while smaller and lighter props are better suited to high KV motors. The KV value can be determined by the number of copper wire windings on the stator. Generally the higher number of winds decreases the KV of the motor, while lower number of winds increases the KV. The magnetic strength of the magnets can also affect the KV value, stronger magnets will increase KV. By pairing a high KV motor with an excessively large propeller, the motor will attempt to spin fast like it would with a smaller prop, but this will require more torque. As it tries to produce the required torque it will draw more current and subsequently generate too much heat. This will eventually lead to overheating and it can burn out the motor. This is because when the motor overheats, the coating on the coil will start melting and causing electrical shorts inside the motor. Generally speaking, heavier quad usually pair with medium to low KV motors, lighter quad usually use high KV motors. Some say lower KV motors have higher torque, and higher KV motors have lower torque. While it’s possible, it’s not entirely true. KV has almost nothing to do with torque, but mainly affects the current and voltage limits of the motor. As explained, higher KV motors have shorter windings and thus lower resistance. It lowers maximum voltage rating and increases the current draw for the motor and propeller combo, and not much else. With everything being equal, two identical motors should have the same the torque theoretically even if one motor has a different KV. Lower KV just means you need higher voltage to get it to the same RPM (power). It’s a little more complicated than this of course, but this is a reasonable approximation. One reason that people feel like low KV motors have more torque is the worse voltage sag with high KV motors, which kills the torque. In theory they’d have the same amount of torque, but they can’t in reality. Torque is a double-edged sword. High torque motors allows for more rapid change of RPM and faster response time, you will get less prop wash oscillation and it will give you that instant and snappy response. But high torque motors also feel sharper and more robotic, while lower torque motors generally feel smoother and softer. The choice depends on your flying style, and personal preference, and higher torque is not always better. Nowadays, many pilots are troubled by oscillation problems more often than ever, and the issue can be traced back to the modern, high torque, high power motors. These are so powerful they can amplify the output, and create an oscillation feedback loop, which is very difficult to eliminate. Soft mounting your flight controller might just be enough to fix that, but we should try and eliminate that from the source and stay away from extremely powerful motors. Common motor patterns (hole distance) for22xx, 23xx, 24xx motors are 16x16mm and 16x19mm. Most 5″ frames should support these. You might have seen specification such as “12N14P” printed on the box of a motor. The number before the letter N means the number of electromagnets in the stator, i.e. poles, and the number before P means the number of permanent magnets in the bell. Different sizes motors have different number of poles, 22XX and 23XX motors generally have 12 poles and 14 magnets. The number of poles determines the spacing between the poles if you have fewer poles, you can fill in more iron content in the stator, so you get more power out of the motor. But with a higher number of poles, the magnetic field is spreading out more evenly, and therefore you have a smoother running motor because you have a more fine controlled over the rotation of the bell. The pole configuration has to be a multiple of 3 because it’s a 3-phase motor and there are 3 wires into the motor, therefore the pole numbers have to be 9, 12, 15, 18 etc. That’s why the pole number is not easily changed, and thus it’s not an essential piece of information when picking motors especially for mini quad. The number of copper windings or ‘turns’ on a stator pole determines the maximum current a motor will draw, while the thickness of the wire determines how much current the motor can handle before overheating. Fewer turns = less resistance = higher KV. The downside is a reduced electromagnetic field on the stator and thus lower torque. The opposite happens when we have more turns in the coil. The increase of copper produces a larger magnetic field on the stator pole and generates more torque. But due to the longer wires and higher resistance, the KV of the motor decreases. To tackle these issues when increasing the power of mini quad motors, manufacturers choose to increase the number of windings while using thicker copper wires. This will effectively reduce the resistance in the winding, and improve the power without sacrificing efficiency and torque. The motor would also be able to handle high current without burning out with larger wire gauge. However thicker wires and more windings means a heavier motor, and the winding takes up more physical space so it requires a larger stator. That’s why we are seeing more bigger and heavier motors, and that’s also why bigger motors are generally more powerful. Single stranded windings are thicker, therefore manage heat better and better suited for those who run higher voltages like 5S or 6S. But you cannot pack as many wires around the stator because the gaps are larger between the thicker wires. Multi stranded windings use 3 smaller wires to replace the 1 thicker wire in single stranded windings. Due to the thinner wires, they don’t carry as much heat and they will break easier physically. But generally multi-stranded windings provide better performance than single stranded windings because you can pack the wires more tightly around the stator thanks to the smaller gaps between wires, and this will give you stronger magnetic field and a more powerful and efficient motor. Note that the neatness of winding is also important, not only aesthetically, but also electrically. If the winding is messy and has a lot of wire crossings, the wires doesn’t cross the stator perpendicularly and the resulted magnetic field will be less efficient. We don’t talk about bearing a lot in motor discussions, because there isn’t much info available, but I thought I should give you a basic introduction. The size of the bearing is not the outer diameter or the inner diameter, but the difference between the outer and inner diameter. The wider it is the larger the marbles/balls it can fit inside it. Larger balls can take more abuse to break, hold up better to a crash. But smaller balls are more stable and smoother at high speed/RPM. You have probably heard about motors using “Ceramic Bearings”? They use ceramic balls instead of metal balls, and they are indeed smoother, but easier to break. The diameter of the hole in the bearing (inner diameter) also determines how big a shaft you can use. How to Decide on Motor Size? By knowing the frame size, we can estimate what motor size we should use. Frame size limits props size, and each prop size requires a different motor RPM to generate thrust efficiently, this is where motor KV comes in. You also have to make sure that the motors produce enough torque to spin your choice of propeller, this is where your stator size comes into play. Generally bigger stator size and higher KV means more current draw. This table below is a general guideline, it’s not a hard-set rule, you might also see people using slightly higher or lower KV motors than this table suggests. It assumes you are powering the quad with 4S LiPo batteries, and frame size is referring to the wheelbase (aka diagonal motor to motor distance). It’s important to understand that voltage has a large impact on your motor and propeller choice. Your motor will try to spin faster with a higher voltage, thus draw a higher current. Ensure you are aware of how much thrust your motors produce and how much current they will draw. When you know the current draw of the the motor and prop combination, you are now ready to choose ESC for your drone. The decision here really depends on your application, flying style, and how you want your aircraft to perform. Thrust is probably the first thing people look at when choosing a motor. Higher thrust gives you faster acceleration, but you also need to be aware of current draw and efficiency. Don’t abuse your batteries with an amperage-hungry motor/prop combo. If your quad draws a lot of current at high throttle, the maximum discharge rate of your battery has to be able to keep up. The battery must also have a large enough capacity to ensure acceptable flight time. While thrust is an important aspect in selecting a motor, it’s not the only thing to consider. The weight of a motor often gets overlooked, which can be a very important factor for acrobatics and racing drones. Since the motors are mounted at the four corners of the frame, they have a strong influence on the responsiveness of your quad. Heavier motors increase the angular moment of inertia of your quad, the motors must work harder in order to change attitude. In practice, when your quad is doing flips and rolls, it takes time to pick up angular acceleration, move to the desired position and stop. Heavier motors will take longer to pick up that angular speed, and also longer to slow down. That’s why it feels less responsive. Motor efficiency is typically calculated by dividing thrust by power at 100% throttle, measured in grams per watt (g/w). The higher this number is, the more efficient the motor. It’s important to look at efficiency through the whole throttle range, not just the top end. Some motors might be efficient at lower throttle, but could lose efficiency by drawing increasingly higher current as they approach their limits. Another good way to look at efficiency is to use “grams per amp” (thrust/current). Generally, the more thrust generated, the larger the current drawn to produce that thrust, so motors with high thrust and low current are preferred. Inefficient motors either generate too little thrust or draw too much current. Every motor responds differently to different propellers, carefully choosing your propeller is the key to balance thrust and efficiency. Many quadcopter motor properties are not mentioned by the manufacturers and can only be found through more technical testing. Torque is the force that turns the propeller, it determines how fast a motor can increase and decrease RPM. In other words, how easy it is for the motor to move the mass of the rotor, prop, and most importantly, the air. Torque greatly affects the performance of your quad, specifically, how precise and responsive it feels in flight. A motor with high torque gives more snappy response, because of the faster change of RPM. You might even experience less prop wash with more torque. High torque also means you can run heavier props (at the cost of drawing more current). If a low torque motor is driving a propeller that is too heavy for it (aka over-prop), the motor will be unable to produce enough force to spin it at the desired RPM, resulting in poor efficiency and overheating. One drawback of high torque motors though, is oscillation. Motors with high torque are able to change RPM so rapidly that it can actually amplify error (in PID loop), causing oscillation that can be hard to eliminate even with PID tuning, especially on the yaw axis. Motor Response Time is also dependent on torque, high torque motors often have faster response time. One easy way to measure response time is to see how long it takes for a motor to reach maximum RPM from 0. Response time will be affected largely by the weight and pitch of your propeller choice. Remember that atmospheric conditions can have an effect too. At low altitude, for example, the air is thicker, this means that there is a greater number of air molecules that the propeller must physically move, to produce thrust. At high altitude, your props will spin faster and react quicker to changes in throttle, but the overall thrust will be reduced, because there are fewer air molecules for the prop to interact with. Temperature affects brushless motors because the magnets used in our motors have a weaker magnetic field when operating at high temperature, they also demagnetize faster at the motor gets too hot which affects lifespan. Over-propping your motors and using full throttle excessively, will cause your motors to run hot. This will degrade the performance of the motor and the magnets over time, therefore motor designs which aid cooling often equates to a longer lifespan. That is of course, provided you don’t destroy it in a crash beforehand! Vibration caused by the motors can have a number of unpleasant side effects to the performance of your quad. If a motor has poor balance or build quality, you might experience vibration that can affect your PID controller. As the frequency of the vibration changes at different throttle levels, this can make your quad very difficult to tune. A motor suffering from vibration will also produce a greater amount of electrical noise than one which is running smoothly. This electrical noise can affect your Gyro sensor, making flight performance even worse, and it will also degrade your FPV video quality if you are powering your FPV system from the same battery as the motors and ESC’s. Many have successfully soft mounted motors, and the flight controller to reduce vibration, with some really positive results. Remember that damaged, bent and unbalanced propellers can also cause problematic vibrations. There are so many variables that affect the performance of a motor, it can get very controversial and complicated. For example, motors with the same stator size and KV, you can have very different thrust, current draw and response time even using the same prop. Differences in the design and material both have a great impact on performance. Here I will explain a few different motor design features that contributes to better performance, which can also change the characteristics of the motor. The construction of motor shaft is changing over time. It used to be a solid aluminium rod, later manufacturers start using hollow shaft with titanium. Similar weight but much stiffer and harder to bend. However drilling the hole in the middle of the titanium shaft increases the cost of manufacturing significantly. And more recently they’ve come up with a new motor shaft design, by inserting a steel rod in the hollow shaft for the extra strength. Magnets used in brushless motors are graded according to their magnetic field strength, such as N52, N54 etc. The higher the number, the stronger the magnetic field. A stronger magnetic field is theoretically capable of generating power more efficiently, providing more torque and a faster motor response time. When you turn a motor by hand, you can feel the notches, the stronger you can feel them is actually a bad thing because it tells you how strong the magnetic force is, and how weak it is in between magnets, which tells you the magnetic field is not even. Weaker notches usually means a smoother motor. Magnets will lose magnetic strength when they reach certain temperature, therefore N52H is used to prevent this problem. The letter at the end has to do with operating temperature. It’s said that N52SH can withstand even higher temperature, but there is no data at the moment to indicate how much better N52SH is compared to N52H and N52. It’s possible that magnets get loose in crashes or due to vibration. You can glue it back in the bell using Loctit 438. A lamination is the thickness of the individual sheets of metal stacked up in the motor stator, thinner lamination allows you to stack more layers of stator plates for the same height of the motor stator. In a nutshell, the thinner stator lamination, the better. Laminations help to reduce a phenomenon known as Eddy Current, which generate heat in a changing magnetic environment. Thinner laminiations means less power is wasted on generating the eddy currents (leads to undesired magnetic field) and making motors more powerful and efficient. “Air gap” in a motor refers to the distance between the permanent magnets and the stator. Magnetic force degrades non-linearly with distance, so reducing the gap between the two significantly boosts the power of the motor. A smaller air gap not only makes the motor more powerful, it also improves torque and response. The downside of tighter airgap is the increase in current draw and decrease in efficiency. 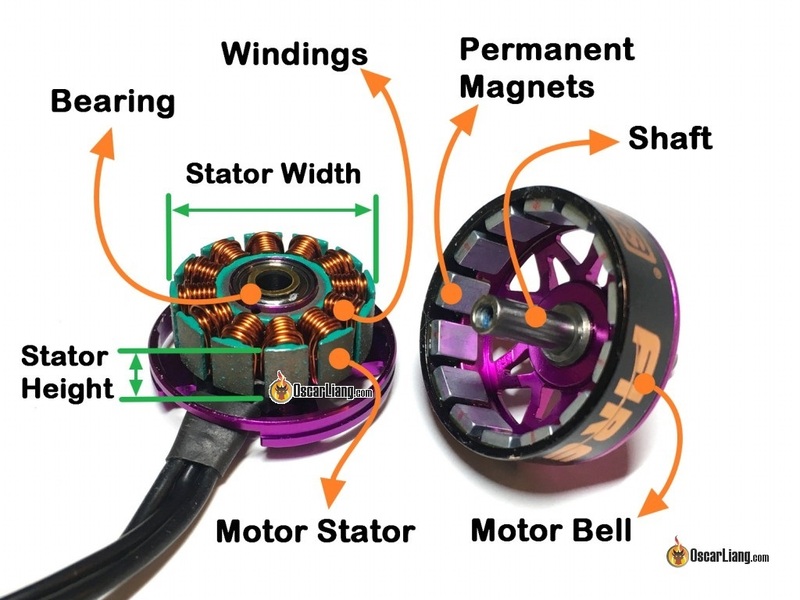 Also there is concern regarding durability, if the motor bell takes any sort of impact and it gets out of alignment and shifted at all, the magnet can run into the stator and end up getting shattered. Using arc magnets (aka curved magnets), is a technique to bring the magnets even closer to the stator; allows for a smaller and more consistent air gap. In fact, the way a permanent magnetic field works means that with a curved magnet, the strongest magnetic point of each pole is no longer on the surface of the magnet, as it is with standard (non arc) magnets. The ‘epicentre’ of the field of the pole on the outside of the curve, will be below the surface of the magnet, and the epicentre of the pole on the inner curve will actually be above the surface. In this manner, the magnetic fields of the permanent and electromagnets are actually brought even closer together, over and above the physical reduction of the air gap. Apart from the shape, some manufacturers test mini quad motors with different thicknesses of magnet, often finding that a slightly thinner magnet (therefore a weaker magnetic field) can actually provide better results. To hold the motor bell to the base, motor manufacturers use one of these methods on the bottom of the motor to lock the shaft in place: C-clip, E-clip or a screw. Each of these ways has their pros and cons, and it’s hard to say which one is the best. Generally speaking, screws are better for user maintenance as it’s easier to remove a screw than a C-clip or E-clip. But screws suffer from risk of over-tightening and locking the shaft (making the motor harder to spin). There are reports about C-clips popping off during flight, which resulting the motor bell flying off and causing a crash. However, be aware that screws are also not immune to this problem. Naked bottom or closed bottom? In motor base design, there is the more traditional “closed bottom” approach, and the more recent “naked bottom” style. There are pros and cons to both of these designs. The “closed bottom” design means a stronger base, however the “naked bottom” tend to be lighter by removing the excess material, the weight saving is around 2g. Closed base motors are less likely to get dirt trapped inside the bell, against the argument that, naked bottom are easier to clean the dirt out. However, the closed bottom provides better strain relief to the wires in case of crashing and stretching. A flux ring is the round steel ring inside the bell that contains the magnets. The bell is usually made of aluminium, while the flux ring is made of steel because it has to respond to magnetic field lines. The latest flux ring design is a custom shape instead of the usual round shape, which can help direct more magnetic field lines back into the motor and improve the torque. The “Pop on Pop off” system is basically a motor shaft with spring loaded bearing for installing and removing props quickly. For a more detail overview and product list check out this article. Motor manufacturers are constantly experimenting with different designs and levels of hardware integration, which has led to advances in cooling and even integrating ESC inside the motor. Personally I think solder tabs on the motor can come in handy, it allows you to use a lighter gauge wire to save weight on less amp hungry applications. They should also be easily repairable if the wires get pulled off, which can often spell the end of a motor of typical design. You will sometimes see brushless motors labelled as CW and CCW. They stand for “ClockWise” and “Counter-ClockWise”. While this is important for brushed motors because the brushes wear out quicker when rotating in the wrong direction, brushless motors are not limited in this way. CW and CCW brushless motors are essentially the same motor that can spin both directions. The only difference is the direction that the prop shaft is threaded. The motors on a quad spin in different directions, the intention here is when the motors spin, all four prop nuts get tightened. Personally I prefer to have the same threads on all my motors, so I don’t confuse myself with the different prop nuts. If you have to replace a prop nut at the hardware store, it can be a real headache trying to find a CCW threaded locknut (or more commonly in the hardware jargon, a ‘left hand thread nut’). When you receive your motors, the first thing to do is balance them. Although it’s not always necessary, it’s a good practice. I personally only do this on large motors though such as 2212 or bigger. I find balancing unnecessary for many brand name mini quad motors because the quality is generally good enough. However with cheaper options that are becoming available don’t be surprised to find less attention paid to quality control. There are so many motor options out there, it will give you a headache :D in this mini quad parts list I have compiled all the most popular motor for mini quad. And here is a list of top 5 motors options for mini quad voted by the community. hi, I am a 12 years.I am trying to make a quadcopter that can lift 5 kg. what kind of prop and brushless motor should I use? can you tell me the size of prop and the voltage and current flow of the motor? Hey oscar I am student. I am using fps 450 quadcopter frame with 1000kv motors and 10inch propellers. How much weight would it carry? And I wants to lift 4kg any nice piece of advise for me. which is the best frame for Emax XA2212/1400kv motor?? 2540 props on 150mm frame with 160g only for battery weight… Well, I believe you wanted to build Acro quad for freestyle or small quad races. Maybe I didn’t understood something, but for me it look like your build is underpropped and a way too heavy for 25xx props. With 2.5″ props all build together with battery must weight no more than 120g and for outstanding flight performance less than 100g. In this hardware combination tiny props simply can’t generate enough thrust. 150mm frame usually have arms long enough for 3″ and even 4″ props and your motors are perfect for them. Replace 2540s to decent 3040, 3045, 3050, 3150, 4×3 etc. props with M5 hole (default for your motors). 3S 2200 mAh battery is too heavy and 35C doesn’t support enough for performance flying. All those mAh-s doesn’t make sense if battery weight alone pull you down. For Use 3S (11.1V) 800-1000 mAh batteries with at least 50/100C batteries (65/…C, 75/…C and above is cool too). I’ll bet that BR1806 2280KV motors with 3″ propellers can easy support light 4S (like 850 mAh, 75+C) batteries as well, but that you should test by yourself. Hi Oscar sir, maybe my noob equation but i am little confused for ratio like 1:10 etc.. So please explained and try to easy clear confusion. it’s just how much thrust the propellers and motors can generate in total, versus the weight of the quadcopter. The higher the ratio, the more power it is generally. I am building a 250mm quad. Will a 2450kv motor be too much? Not really, 2000KV to 2700KV are very common for 5″ and 6S mini quad. It depends on the propeller and battery voltage you want to use. Hi Oscar, wonderful articles. Very detailed and informative. I am planning to build a drone for aerial photography. I want to use a 450mm frame with 1045 props. What would be the ideal combination of motors, ESCs and battery for my project? I am trying to build a quad with EMax 810KV motors and EMax 30A Simon Series ESC’s (I believe the firmware is BL_Heli). My FC is DJI Naza M V2, but the motor test using Naza software assistant is not working…all I am hearing a is a click sound from the individual motors and slight twitching of them trying to rotate! I did ESC and receiver throttle calibrations also. Anything I am missing or something I should take care of? I did not find any articles from you on this particular flight controller! Would appreciate if you can give some pointers. Am I using the right ESC’s? The Naza manual says we should use ESC’s with 400Hz frequency…I am totally confused. Hey oscar,Ive got a 230mm would it be alright using a 35amp aio esc with max burst of 45amp on a 2700kv motor with max burst of 51amp @ full throttle on a 3blade 5052. Would adding a 350uF capacitor to help to maintain the amp within the 45amp range of the esc? Hey, im planning to make a drone do you think a emax 2205 2600kv motor will work with a 330mm drone frame also i am using 30A esc’s should what frame size should i choose and will it work with a 330mm frame ? I will recommend bigger motors and lower KV for this size. I’d add 1407 motors in the 3” class. Motors like Brotherhobby Tornado T1 1407 are a perfect fit for a very powerful 3” quad. Thanks for sharing all your knowledge Oscar! Hey is there a chart somewhere with every motor on the market with the details about every motor? I’m trying to find a good high KV motor that is lightweight for racing and without having to do tons of research. Hello Oscar! Thank you so much for writing articles in the easiest way to understand, much appreciated. Now, I’m building a quad with an F450 (450mm size) frame (landing gears included), BR2212 980kv motors with 20A ESCs. Apart from the FC, PDB, Rx my payload would include a small 4k action camera with a gimbal. I also might include a Vtx in the future. Now what I’m most confused is which props to use and which LiPo to go ahead with? If I could get the expert’s advice it would be a great deal. If you are using the same props, it’s likely not generate more thrust, but less. You should be looking at higher KV motors or larger propellers (if your ESC’s support the extra current draw). 17 amps x 4 motors is 68 amps. You battery needs to discharge at least 68amps. The MAH of the battery can be as high as you want it to be as long as it not to heavy. A 4000MAH at 20C discharge is 80 amps. Your ESC’s should be at least 20 AMPS for this motor. Use the prop size recommended by the manufacturer. Thank you so much for everything you teach us through your articles, few people are willing in teach us in this interesting way that you apply. I have a quad whose stock engines are brushless 2212 1150Kv, few days ago, I ordered two engines of the same reference for have extra engines but they sent me reference 2212 950Kv. Then, can I mix 950Kv engines with 1150Kv engines? Another thing: the new engines are X2212. maybe, but the motors will output different power at the same throttle level. the flight controller might be able to handle it and make it fly… but it will oscillate and flies poorly, so try to avoid it. The letter X is probably just a model set by manufacturer, it doesn’t mean anything to me. I’m being 100% serious when I ask this. I’m working on mobile air structures, I’ve already figured gargantuan sized batteries and have figured my total weight to be around 8,000-10,000 lbs. Does anyone have any kind of idea the propellar size, and engine size I would need for this kind of weight? You will need something about the size of a CH-47 Chinook. Seriously. i think better stronger motors is maybe the a better solution but what motors then ? Hi Oscar, it seems like not having data for power systems is very common, which is unfortunate. I am from RCbenchmark and we developed this test stand that really helps with ensuring you have the correct setup for your creation. With this you can measure and record to your computer thrust, torque, efficiency, rpm, all in the same device. It sure beats having to time your flights to test every possible combination! i need a small help regarding selecting the right propeller size and motor KV (brushless) ? In order to fly my quadcopter i need a thrust of each motor 600 GRAMS i.e my total weight of quadcopter is 2500 GRAMS . SO KINDLY GIVE ME DETAILS BELOW !!! try os motor 3805-1200. Hope it might work. 800KV with 10inch props? this one should give you 1KG thrust easily. your blog is great thank you for this..
my name is Marcel im from czech republic…. so my question is how i can improve longer time in air…. also if i can improve propeller or motors for longest time in air…. it’s difficult to say without actually test it, every quad setup is different. I think for your setup, 3S 2600mah would be a good one. But to identify the best capacity VS flight time, check out this post. i have doubt about the orientation of motor. Some motors like ‘EMAX Motor MT2213’ have the proper orientation clock wise or anti clock wise but other don’t.How to choose motors in that case?? Note that EMAX motors come in Clockwise and Counter Clockwise threads for securing the props to the motors, to avoid loosing props mid-flight… you need two CW and two CCW ..
thanks, while choosing the propellers , is it necessary to follow the recommended suggestion given on the motor. I have calculated my own thrust using static thrust calculator which is totally different from the suggested one. It’s not necessary, but it’s safer. Try and see if you can find any thrust tests online, done by third parties. Compare the data and find the best size prop. Or if you are still not sure, doing your own thrust test it’s not difficult. Lol you cannot get any motors for 150 to 300 rs. And I don’t know if you can get the motors in second hand. And also I wont recommend it. Just Buy from Hobbyking brand new and you are good to go. Awesome article, really helpful. Thank you! Hi, I am building a 450 alien X quadcopter total weight so far is 1000g.. 25amps q brain 4 in 1 speed controller,no fpv equipment yet but will be adding once i learn to fly….Anyway I have mistakingly ordered sunnysky x2212 1400kv motors… thinking they were the 980 kv ones..!!!!. So have the wrong motors, these took 6 weeks to turn up so dont want to send them back and wait another 6 weeks… the quad is almost ready to fly… i have some graphs of the motor specs if you need them.. any suggestions as to what prop size to run… for an easy quad to operate while i learn i dont want speed just longish flight times, currently have 2 2200mah batteries… please advise…. if you want more lift, 9050 is a good choice too. Thanks a lot Oscar for the generous heart to all drone /flight hobbyist like myself now I think now I have got the way to my vision. Though i come from third world country ( uganda) but think you will able to guide me where possible please! Love your blog, it’s no. 1 regarding to getting info and news about multicopters. I have a question concerning the meaning of the motor no. let’s say that here you talk about the 18-11 2000kv Micro Brushless Outrunner (10g) So what would the 1811 mean and I already understand that the 2000 in this case is the rpm. Another example to my question: I saw this multistar 2206-2150kv on HK, again what the 2206 mean? 1811 is basically the indicator of the motor size. first two digit is the diameter (width) of the motor bell, last two digit is the height of the motor. so for example, 2204, is a “fatter”, wider motor, but shorter than 1811. It indirectly implies, the power of the motor: the fatter and taller the motor is, usually it’s more powerful and heavier too. Also the motor mount screw holes might be different according to the size. But this is not always the case, check datasheet before buying. I am a 12 year old and have built a small 330 size quad. I am slightly worried about my motors not being powerful enough for the quad. My quad specs are 1.1kg, D2822 Turigy Aerodrive 1100kv Motors (which have a thrust amount of 540g per motor) and a 2200mah, 3s 40c lipo battery. Am I straining my motors? Oddly, the battery, ESCs and motors are barely warm at all after flight. I also carry a gopro and the motors and other parts are fine. I look a the dji phantom which is much lighter and it has 935kv motors… Am I missing something? The quadcopter is also still quite maneuverable has normal flight characteristics as my others. Just want to make sure I don’t damage my quad! P.S. I am running 8*4.5in props for lifting more! Update: the weight is actually 1.2 kg and the motors are also quite warm now after flight and with a go pro, I take off at 1/2 throttle (a bit more in fact). Without a go pro, I take off at less than 1/2 throttle. it’s great to see young minds like you picking up this hobby. But I am concerned about your safety since you are only 12! Are you being supervised by an adult when doing this project? Quadcopter is not a toy, it can be very dangerous! what you have is flyable. But I would use stronger motors, because 330 size quad should be very agile being able to do arobatics, you probably want to have 1:3 weight to thrust ratio, that means having 3KG of thrust in total, 750g thrust per motor would have been better. But I think 1.2KG for a 330 size quad, is a bit heavy. I think normally that size should be around 800 to 900 grams (including gopro). try to reduce the weight down, and use your current motor should be fine. Hello, I have a beginner’s question. The Low Kv or the High Kv motor? I’m building a quad and I want to get a few more minutes of flying time and I don’t know if I should use a 1000 kv motor or something around 700kv, I know I’ll be using different size propr obviously but which motor requires more power to spin? Hi, If it’s the same model motor, the higher KV motor will draw more current with the same voltage and prop. For example, the Cobra 2204 2300KV will draw more current (higher power) than the Cobra 2204 1960KV at 3S battery. Usually I order from hobbyking, but I can’t find at the thrust data in the data sheet of the motors. How can I calculate the thrust of the motors? If it possible of course. What would you recommend (motor and prop) for 2kg weights fpv flying? My quadcopter: SK450 with “landing gear”, KK2, turngy plush 30A, NTM Prop Drive Series 28-26A 1200kv / 286w, 1045 prop. First I tried to fly this config with 845 prop, but it could not take off, then I changed to 1045. It lfew for a while but I recognized the motors where to hot, and the battery also, so I stopped. I knew this config won’t enough strong for that flying but I had to try it. there is no way you can calculate the thrust of a motor accurately, unless it’s provided by the manufacturer, or measured by yourself. have you checked the “file” tab in the product page on Hobbyking? sometimes there is a datasheet file in there, or data from some users. If no, try google it, I am sure someone has measured this and share on the internet. NTM Prop Drive Series 28-26A – This motor seems to run best with 1060 props, each motor can generate 967g thrust for 19A at 100% throttle, so this motor should be good enough for 2KG quad. However, also make sure your battery’s C rating is high enough. Thanks for ur valuable comment sir, i would also like to know what will be the flying time with 10×4.5 prop and above said configuration sir. And Sir as soon the buzzer of the low voltage alarm starts we need to land the quad sir? I would suggest to try 9 inch and 10 inch propellers, see which is better. 9 inch should give you better stability, but 10 inch will give you longer flight time. Total weight of your quad? Max Thrust of your motors for the battery you are using? Current draw of your motors? C rating of your battery?